Successful lab meetings are a collaborative process that can be continually improved upon. There is no doubt that technology has influenced and even changed the way we communicate at the workplace. Whereas face-to-face and telephone conversations were likely the most common means for relaying information just a couple of decades ago, we now rely on email and instant text-based messaging for both ease and speed. And although these forms of interactions have taken root in our culture and are indeed useful, managers running businesses and laboratories still make time to meet with staff, both one-on-one and in the form of group meetings. That’s because managers understand that getting together allows their team to interact on a personal level, which can foster a sense of community within the organization, allow individuals to cite issues of what is and isn’t working, and give everyone a chance to brainstorm, among other things. For Chris Hudalla, founder and chief scientific officer of ProVerde Laboratories in Massachusetts, almost everything that’s been improved in his lab is a result of a meeting. “When it was just me in the lab, it was just my workflow,” he says. As sample volume increased, however, the corresponding workflow practices didn’t change much to accommodate that increase. But as the number of employees increased and they weighed in on ways to improve, the workflow methods were also enhanced. “Almost all of [the improvements are] a function of a laboratory meeting,” he adds. An example of dramatically increased efficiency for this cannabis-testing lab involves the process for one of their sample preps for heavy-metal digestion, which required three or four additions of multiple reagents to a sample vessel, a precise task that was time-consuming. Then, a staff member in a lab meeting suggested mixing all the reagents together beforehand and storing the combination in a bottle with a metered dispensing top, so instead of contaminating several different pipettes and other vessels and adding each reagent one at a time, they were premixing it. “Now, when we get a sample, we just use the bottle and one quick shot of the sample and we’re ready to go,” Hudalla says. “It seems like a trivial, small thing, but that one small change had a dramatic impact in terms of technicians’ throughput in sample processing of metal analysis.” Such can be the impact of exchanging ideas within a group working on the same overarching goal. For these reasons, it’s important not only to hold lab meetings but also to make sure the meetings are effective and organized. Because the nature of each lab’s experiments, workflow, and employee configuration is unique, meetings need to be tailored to suit each organization. Some managers find having a rigid meeting schedule and structure works best for them, whereas others might discover impromptu and more relaxed meetings are better-suited to their laboratories. Michelle Natarajan is the laboratory manager at the St. Croix Watershed Research Station, Science Museum of Minnesota, a private, nonprofit research facility that focuses on paleolimnology. The research station has four labs, with the main one focused on weighing, digesting, and analyzing a variety of nutrients and toxins in sediment and water samples. She supervises two full-time lab technicians. However, scientists, graduate students, and visiting researchers also use the labs. Their research station has about 10 to 15 total employees at any given time and the scientific staff meets twice a month. But it is not often that her organization holds lab-only meetings. “I communicate with lab techs daily about changes, updates, and priorities, but this generally happens on an informal basis,” Natarajan says. “I have conducted a few meetings, but usually, it is when a new intern, graduate student, or staff member starts in the lab, maybe once per year, on average.” While their research station meetings include a series of updates regarding topics like fieldwork, grant proposals, and papers published, followed by a scientific talk given by one of their scientists or a visiting colleague, their lab-only get-togethers are generally very focused on the reason for the meeting and any lab-specific updates. “For example, we might introduce ourselves to a new member of the team, share concerns, and discuss a change in procedure or a new instrument,” Natarajan continues. Conversely, Rick A. Armstrong, laboratory manager at Lee County Environmental Lab in Ft. Myers, Florida, not only meets with his staff often but also on a very set schedule. His staff meetings are usually on the last Friday of the month. He, however, likes the meetings to be informal and an opportunity for the staff to share information and any accomplishments that are pertinent to the group. “I want to make sure everyone knows about especially good work and give congratulations where due,” says Armstrong, who caters lunch for the meetings and allows any staff member whose birthday fell in that month to choose the menu. Hudalla’s approach falls somewhere in the middle, and although his lab’s meeting schedules vary according to who is involved, his company holds general lab meetings about once a month. Though they are typically scheduled, because of the hectic nature of their business—and the fact that he and his business partner often travel—the meetings are at times impromptu, with only a day or so advance notice. “Basically, we’ll say, ‘Hey, is everyone around tomorrow?’ and so we’ll get pizza for lunch and we try to keep [the meetings to] about an hour, though they usually go an hour and a half, two hours, because there’s usually so much stuff to discuss,” Hudalla says. These varying meeting structures, all of which work for their respective labs, are indicative that “one approach fits all” is not the way to think of organizing a get-together and that managers will, after time, come to learn the specific structure that better advances their goals. Managers use various techniques to ensure that meetings are productive and conducive to a better work environment. This can include basic brainstorming, technique review, developing game plans, and methods to foster a nurturing work environment. For most everyone, having some sort of agenda—be it a formal one that’s handed out to the staff before or during the meeting, or an informal one that the team leader uses—is an essential part of running successful meetings. But whether short or long, a meeting is not a good use of anyone’s time if, at the end, people don’t find it an atmosphere to share new ideas and suggestions or if any viable proposals or identified gaps are not met with specific actions. “This requires somebody taking notes in the meeting and having actionable items identified and following through with that,” Hudalla says. Otherwise, if one holds a successful meeting where great suggestions are brought up but no action comes of it, the time spent on the meeting is essentially wasted. “This is what would happen when we started; we had great discussions and then nothing would happen because we are all just too busy,” Hudalla says. One of the best ways to address this issue is to make a note with bullet points of some of the suggestions that are addressable, especially in the short term. Such an approach not only ensures that the staff feels their opinions are valued, but it’s also a way to immediately act on good ideas and potentially improve processes. If a new actionable item can’t be immediately implemented, it can be up for discussion, and the staff can deliberate why and how they can tackle it in the future. This line of attack gives everyone ownership in the process of running a laboratory, because at the end of the day, operating a business is not a one-person job, but is a collaborative process that can be continually improved upon. 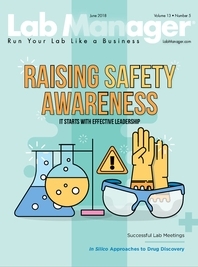 What we can learn from Captain Sully's "Miracle on the Hudson"
By providing guidance, suggestions, and recommendations specific to laboratory safety here, our goal is to help like-minded managers strengthen the safety culture in their labs.